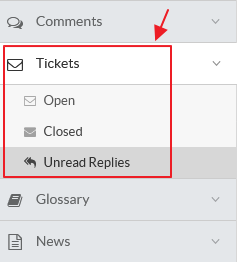 Superusers and editors can expand "Tickets" section in the left navigation bar to view or manage tickets in the knowledge base. Click on "Open" link to view and manage open tickets in the knowledge base. Click "Publish" option from Actions column of Open Tickets page in order to publish a ticket as an article in the knowledge base (Refer figure given below). After this, the software will redirect you to the Publish to Knowledgebase page. You need to fill all the details as mentioned in the figure below. Title: Enter the title that will be the subject of email notification sent to the user. By default, the subject of the question submitted by KB user (end user) is displayed in this field. Answer: Type-in the contents of the answer in this field which you want to send to the user. For convenience, the content of question submitted by the user (inscribed in rectangular box) is displayed in the text area. Type: Select the type of category under which you want to display the article in the knowledge base. For Public and Private category, refer article Adding a new category. Categories: Select knowledge base category/categories from the drop-down list under which the article is to be published. You can select one or more than one category. Keyword (Tags): Enter keywords or tags that classify your article and that are relevant for searching through the database. Summary: Type-in the summarized view of your article for meta description attribute. 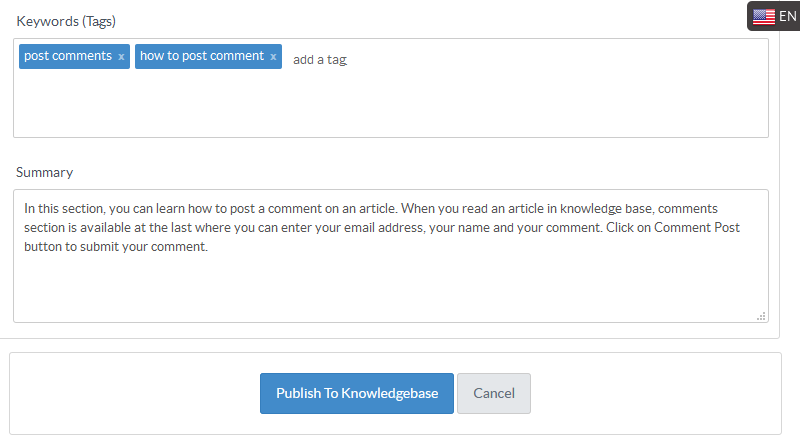 Click "Publish To Knowledgebase" button to publish the answer as an article in the knowledge base. Otherwise, you can click on "Cancel" button to abandon the process.